This is an enormous, Fabric Covered Hat Box. 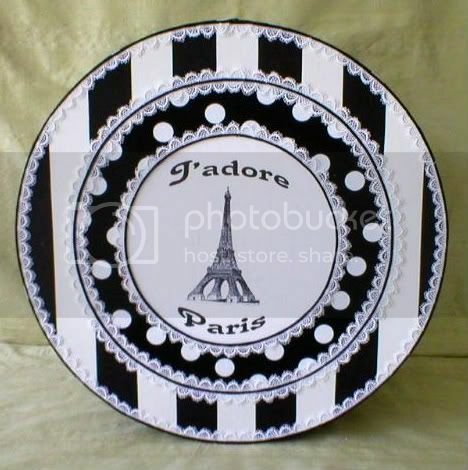 It features a print, on fabric, of the Eiffel Tower and the word: "J'adore Paris" (I Love Paris). The center print is surrounded with an inner ring of Black and White Polka Dot Fabric and an Outer Ring of Black and White Striped fabric. Each ring is finished with rows of White Venice Lace and narrow Satin Cording. The rim of the lid is black and white polka dots and the base of the box is black and white striped fabric. DIMENSIONS: 16 inches across and 12 inches height. Same design boxes available in: 18 inch, 20", 22" and 24". Add $5 for each size increase from 16" box listed. Contact for more information.